Over 100,000 people welcomed Rtd. Brig. Bio in Kenema, where he told the people that he will fight Ebola until the last day for Sierra Leone to be declared Ebola free. Speaking in Kenema City on Sunday 1st November, Rtd. Brig. Bio stated that in 7 days the country will be declared free of Ebola, but until then the people should not relent in the fight because Ebola is a very stubborn disease. Rtd. Brig. Bio thanked the people of Kenema, the district Ebola response team, traditional leaders and medical professionals for their efforts in the fight against Ebola. He expressed his condolences to the families who lost their loved ones in the fight against Ebola. Speaking also at the social mobilisation event was the outspoken and respected Dr. Kadie Sesay, who thanked the people of Kenema and stated that the people have spoken with a great welcome. She said the people have told the world Rtd. Brig. 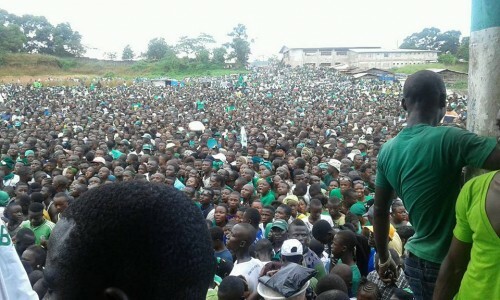 Bio is a quality product for SLPP and when the time comes they will tell the world why they are supporting Rtd. Brig. Bio. But that will be after defeating Ebola. She also thanked the elders and everyone who came together to fight the Ebola disease and re-echoed Rtd. Brig. Bio’s message during the tour of no complacency. The Mayor of Kenema City Council, His Worship Joseph S. Kelfala, welcomed Rtd. Brig. Bio and entourage to the city. He spoke on the Ebola situation in the district which he said has caused devastation for many people. The programme was chaired by the eloquent and firebrand SLPP Eastern Region Chairman and Acting National Publicity Secretary, Hon Philip Tondoneh. As part of increasing women participation in politics which is in line with Rtd. Brig. Bio’s vision, the vote of thanks for the event was moved by the dynamic SLPP Kenema district women’s leader, Madam Ella Goba. On his way to Kenema City, Rtd. Brig. Bio also made a brief stop at Blama, Small Bo Chiefdom, where he made a courtesy call on Paramount Chief Mohamed Dhaffie Benya V and appealed to all to continue to obey the bye laws until Ebola is finally defeated. Paramount Chief Benya V welcomed Rtd. Brig. Bio and expressed delight at Bio’s efforts to eradicate Ebola in the country. Meanwhile, as part of his social mobilisation routine, the Rtd. Brig. Bio and his entourage will visit officials of the Kenema district Ebola Response Centre today, Monday 2nd November to have a detailed report on the Ebola situation in the Kenema district. The over 100,000 people who welcomed Rtd. Brig. 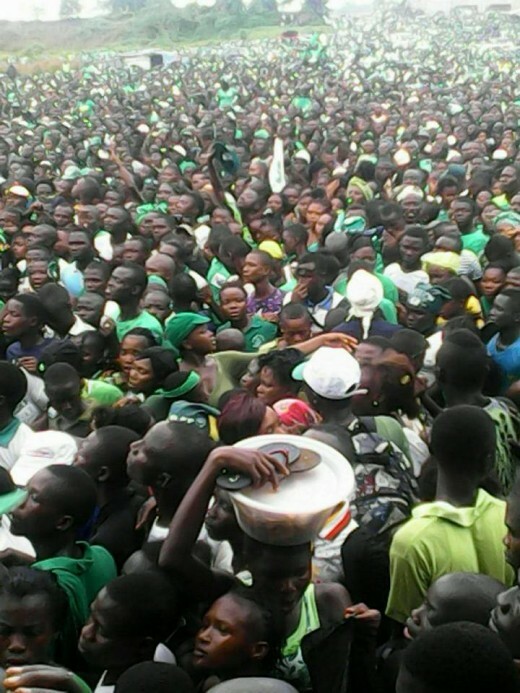 Bio in Kenema have been the largest turnout of people since the final political rally in Kenema during the 2012 elections. As part of the welcome, the people of Kenema also organised a lantern parade and the highlight was a lantern depicting the famous and historic transfer of power between the Rtd. Brig. Bio and the late President Kabbah. More updates and pictures later, as Rtd. Brig. Bio continues his social mobilisation tour of the Eastern Region. i. I witnessed Kandeh Yumkella’s presentation at Rotherhithe in London few months ago, although I can’t recall the exact date. To be honest, he knows how to manipulate and capture the audience attention to listen, even when it is difficult to prove him right or wrong as he continuously referred to UN Statistics he had prepared for his presentation. All SLPP flag-bearer aspirants are in the primary election at the moment but they are all aspiring for SLPP to win the forthcoming General Election. This is the underlying fact. When his presentation arrived at the question and answers section, a question was thrown at him from the audience which goes as follows: “Now, you and other aspirants are trying hard to win which will be decided at the Party Conference in Freetown shortly and not by this gathering here. Suppose you happen to lose to any of the other aspirants, will you support the winner to lead the SLPP to victory or will you split away from SLPP as Charles Margai did to form your own party out of disgruntlement? The answer that Kandeh Yumkella gave to this sensitive question did not go down well, because his answer was that: “We have not yet arrived at that river and when we arrive there, we will know how to cross”. ii. Kandeh Yumkella has been working for the UN, the same organisation Dr. Ahmad Tejan Kabbah retired from when he took over SLPP and led our country out of the civil war that plagued us for ten years. Tejan Kabbah’s election was very timely at the time he came to power because the nation’s calculation at the time was that we needed international community to assist Sierra Leone to end the Foday Sankoh’s civil conflicts. Indeed Dr. Tejan Kabbah’s strategies that resulted into solving the conflict drove him to the point of appointing Foday Sankoh as Vice President in charge of minerals including diamonds. But Foday Sankoh’s intention was to kill Tejan Kabbah. But the Almighty God did not listen to him. Tejan Kabbah furthered on and did not leave any stone unturned and luckily for him, he had Kofi Annan who helped greatly as Sierra Leone received the highest number of UN Peace Keeping force. Thank you Kenema. Thank you my people of the East. Thank you also our detractors who also joined the people of Kenema to welcome home our brother, our Presidential Candidate and his Running Mate, our Mama Dr. Kadie Sesay. I want to honestly thank Dr. Ernest Bai Koroma, Fountain of Peace and security/Constitutional Expert/ Insurance Consultant/Holder of the famous Super supreme Executive Power vested in him and him alone, as he watched the event in Kenema on his 500″ Plasma TV – but all protocols observed. The population of Bo, according to the last census is 306,000. That of Kenema, which is just 45 minutes away is 545,327. 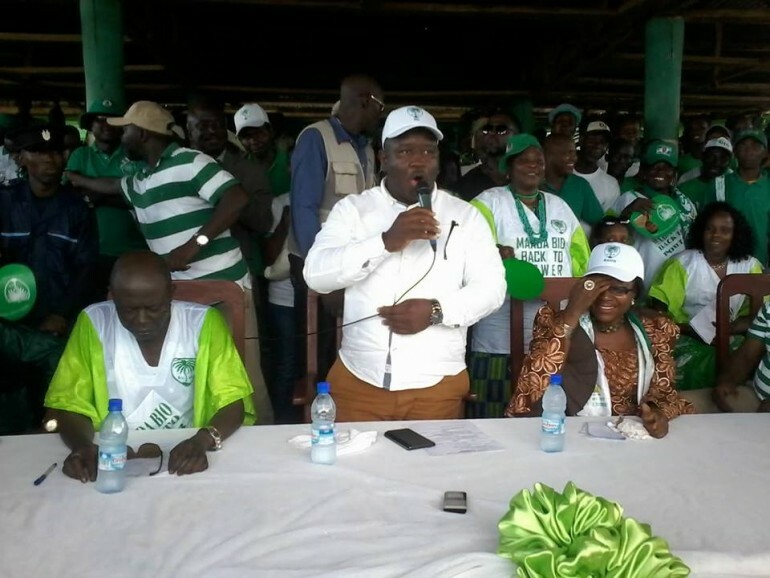 Since these two cities are the bastions of SLPP politics, it is very possible that Maada Bio, who is revered in this part of Sierra Leone can draw a crowd of even more than 100,000. Make no joke about it, the Southeast is Maada Bio’s backyard. I know this for a fact because I am from there. Over 100,000 people welcomed Bio in Bo. Does the Bio Communication Team believe that Sierra Leoneans are so stupid to believe that he attracted such a crowd or is this simply a typo with one or two extra zeros thrown in.